The short answer is Yes! millions of tourist visit Israel each year, and consider it is far safer to visit Israel then any major city in the US. When visiting take the usual tourist precautions; don’t leave personal items unattended, use the safe deposit box at your hotels, be more mindful where you go at night, travel in groups and accompanied when possible. Will tour get cancelled if there is political trouble? I'm traveling from Australia, UK, etc. can I join tour? Yes, our guest are from all parts of the world & we can help you get there! Call us toll free US/CAN 800 933 4421 or 323 655 6121 for international calls to find best available flights (rates, seats, departures, connections). There are over 80 airlines which operate flights to Israel’s Ben Gurion International Airport. Let us help you find the perfect flights for you. I'm traveling alone can I join tour? 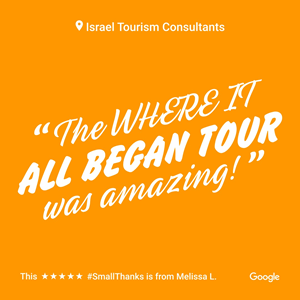 Yes, many of our guest have made life-long-friends during our tours experiencing Israel in a group setting. Single travelers pay a single rate for the hotel accommodations. Please note we do not find another passenger to share a room. When is the best time of year to tour? 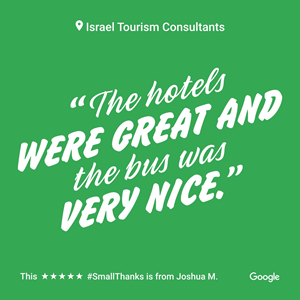 Besides September or October (depending on the month Jewish Holiday's fall in the year) due to the Jewish Holiday's with limited hotel availability, and higher airfare rates, we recommend travel to Israel year-round. Israel is also considered a year-round destination due to it's climate. The country is privileged with long warm, dry summers, and mild winters, and cooler weather in the hill regions like Jerusalem and Safed. What should I wear; how should I dress on my tour? For Summer, lightweight T shirts, sleeveless shirts, shorts, and a bathing suit are recommended. Pack a sweater or a jacket for nights in the mountains or the desert. In Winter, bring long sleeve shirts, sweaters and a scarf, gloves, a warm coat, and a raincoat and an umbrella. 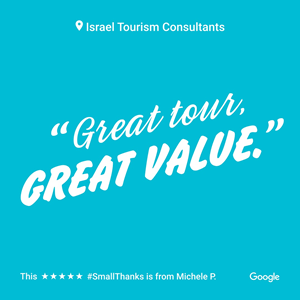 Some religious sites require long pants for men and clothing that covers the shoulders and knees for women.​ Israel escorted tours require a lot of walking therefore bring comfortable shoes and sun protection including a hat, sun screen lotion, and sunglasses. You can also bring a backpack to help you carry day-to-day touring items you may need including bottled water. The Shekel; abbreviated as NIS (New Israeli Shekel). We advice to check the exchange rate prior and or during your trip. You can use your ATM card to obtain Shekels at ATM’s throughout Israel. You can also use American Express, MasterCard and Visa cards at most Israeli hotels, restaurants and stores. If you wish to take some cash, take US dollars as these are easily exchangeable in Israel. Keeping in touch in Israel? Most hotels offer free Wi-Fi for guests and or customary price. Many restaurants adn cafes provide complementary Wi-Fi service. Tel Aviv offers a citywide free Wi-Fi network which provides more then 80 free Internet “hot spots” across the city. For cellular phones if you have an international plan, your cell phone may work in Israel, please check with your local provider. There are also many options to rent a rent a phone when you arrive at any time during your visit. Some hotels such as the Leonardo hotels offer free international calling for their guest. The country code to dial to Israel is + 972. What about health, medicines, and vaccinations for Israel? Israel is a modern country with excellent healthcare and has the world’s highest number of doctors per capita. No vaccinations are required to visit Israel (unless you recently traveled to an area where there are epidemics of yellow fever, cholera or ebola). You can find most standard over-the-counter drugs in Israel that are equivalent to the ones you find in North America. You can also bring supplies of your prescription drugs with you (If you need to bring syringes and vials of medicine – bring along a letter from your doctor attesting to your needs, just in case it’s needed.). Travel insurance (including medical coverage) is always highly recommended for all foreign travel. I do not speak Hebrew, is this ok? Hebrew and Arabic are the Israeli official languages, however many also speaks English. You’ll even find many street signs written in English so if all you know in Hebrew is “Shalom” for hello & goodbye, you’ll get along just fine. What if I want to visit another Arab country after Israel?